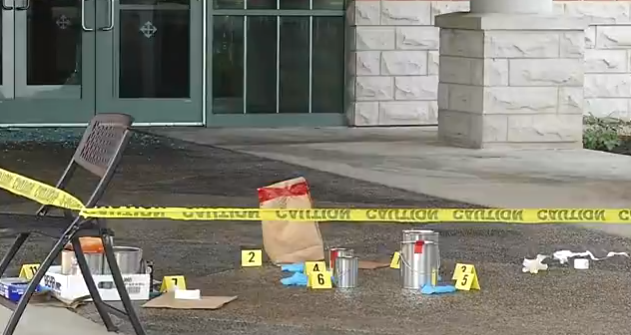 AMHERST, N.Y. — Police in New York are investigating after a firebomb was thrown inside of a door at a non-denominational church on Saturday. “The fire inspectors office determined up to $10,000 in water damage,” he said. Police are now looking at surveillance footage from both the church and area businesses to obtain clues as to who might have thrown the explosive at the church. Officials are also considering whether the act can be considered a hate crime. Services are still scheduled to move forward this morning at the Chapel at Crosspoint despite the incident. The incident occurs just weeks after bombs were found planted at three houses of worship in New Mexico. As previously reported, last month, police responded to a call about an explosion at Calvary Baptist Church in Las Cruces, where reportedly a bomb had been wrapped in newspapers and placed into a mailbox that had been bolted to the wall. The force of the explosion ripped the mailbox from the building, throwing it approximately 150 feet. Earlier that morning, a bomb had also been detonated while a Roman Catholic congregation was in the middle of its 8 a.m. service. It had been placed in a garbage can near the front door of the facility. Days later, a third bomb, which had not exploded, was discovered outside of the First Presbyterian Church of Las Cruces by a groundskeeper. The device had been inserted inside the sprinkler box by the front door. The high school across the street was placed on lockdown and businesses were evacuated while the authorities detonated the device and ensured that the area was safe.